April 22-23, 2016, Poetry Press Week premieres outside of Portland, OR as part of the O, Miami Poetry Festival. 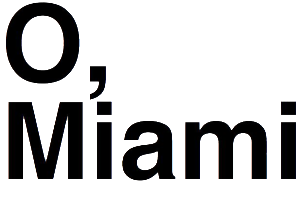 The mission of the O, Miami festival is for every single person in Miami-Dade County to encounter a poem during the month of April (National Poetry Month). April 23: Laurel Nakanishi, Denise Duhamel, Gregg Shapiro, M.J. Fievre, and Yaddyra Peralta. The show is free, but an RSVP is required.